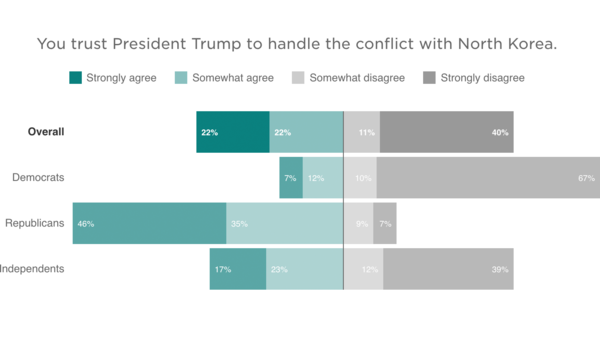 A narrow majority of Americans don't trust President Trump to handle the conflict with North Korea, according to a new NPR/Ipsos poll. The findings come as the president and his diplomatic team prepare for the United Nations General Assembly in New York this week, where North Korea's renegade nuclear program will be a major focus. The survey found 51 percent of Americans distrust the president's ability to contain the North Korean government in Pyongyang, including 40 percent who have strong concerns. "I think North Korea is playing him," said independent James McDaniel of Munford, Tenn., one of the poll respondents. "I think you have a lot of countries that are trying to test President Trump with his lack of experience and leadership. And I think that North Korea is just trying to bait him a little bit." Lynn Sigfred, a registered Republican who lives outside Milwaukee who was also surveyed, said she worries about how the president is handling North Korea and prefers the way U.N. Ambassador Nikki Haley has addressed it. "Just based on how he's reacted to other world situations, it's really hard to say what he'll do," Sigfred said. "He's a bit unpredictable." As with many issues, mistrust of the president is heavily concentrated among Democratic and independent voters. More than 8 in 10 Republicans say they trust the president to handle the situation. "The partisan split matches almost exactly what we see in Trump's approval rating," said Ipsos Vice President Chris Jackson. The Trump administration has successfully pressed the U.N. to impose increasingly stringent economic sanctions on North Korea in response to that country's ongoing tests of nuclear weapons and ballistic missiles. Trump has also insisted that military options remain on the table, with provocative tweets threatening "fire and fury" if Pyongyang continues to threaten the United States. The president has unilateral authority to launch a nuclear strike — a fact that surprises many Americans. Only about a quarter of the people surveyed know that Trump can order a strike on his own authority. Most incorrectly think he needs to get Congress' approval. "A large majority of Americans, three-quarters, think that there is some sort of check — that either he has to get approval from Congress or he has to coordinate with the secretary of defense or he has to get confirmation from the Joint Chiefs," Jackson said. "A lot of people don't seem to really get it, just how easy it is procedurally to order a nuclear attack." That is an astonishing fact given that Trump's temperament — and whether Americans could trust him to have his "finger on the button" — was a critical piece of the anti-Trump message in the presidential campaign. At an event in Ohio, where she delivered a closing argument about a week before the election, Democratic candidate Hillary Clinton was introduced by Bruce Blair, a former nuclear missile launch officer, who argued against Trump being president. The campaign even ran an ad featuring Blair. That message apparently did not break through. Sigfred acknowledged she was uncertain about limits on the president's power. "I would hope that he would listen to his advisers and not take a proactive strike," she said. But she worried, "If he's able to implement, he'll do what he wants." More than half of all Americans think the U.S. should never use nuclear weapons. That view is more common among Democrats and independents than among Republicans. "Americans realize just sort of how terrifying these things are and don't want to see us as a country continuing or spreading their use," Jackson said. The stakes of the conflict have grown higher as North Korea has continued to refine its nuclear weapons and the ballistic missiles to deliver them. Over the summer, Pyongyang tested a missile that, for the first time, appeared to have the range to reach the continental United States. Nearly 60 percent of Americans are aware of that newfound capability, which has increased concern about North Korea. But 1 in 5 people surveyed believe incorrectly that Pyongyang lacks the ability to strike the U.S. And 22 percent aren't sure — not surprising, since the rapid evolution of North Korea's hardware has confounded many intelligence experts. "It is sort of a moving target, and there's potentially a lot of confusion," Jackson said. "That sort of contributes to people's sometimes blasé attitude about North Korea." Kim Jong Un's regime has also been experimenting with increasingly powerful nuclear devices, although it's not yet clear that North Korea has the technical capability to combine a nuclear warhead with an intercontinental missile. North Korea's bellicose tests have also caused alarm in neighboring South Korea and Japan. Although Trump questioned the cost of defending those countries during his "America First" presidential campaign, the administration has since reaffirmed its "ironclad" commitments. Nearly three-quarters of Americans agree that the U.S. has an obligation to protect its allies in East Asia — a view that is widely shared by Republicans and Democrats alike. North Korea's nuclear saber rattling has certainly helped to raise awareness of the country. While Americans are often disparaged for their limited knowledge of geography, nearly 6 in 10 correctly identified North Korea on a map of East Asia. Republicans were somewhat more map-savvy than Democrats, and independents outpaced both. The online poll was conducted Sept. 11 to 12, before North Korea's most recent missile test. Ipsos surveyed 1,005 adults, including 322 Democrats, 357 Republicans and 219 independents. The poll has a margin of error of plus or minus 3.5 percentage points. How to deal with North Korea? That's a question that'll be front and center when the U.N. General Assembly meets in New York this week. President Trump will be there along with dozens of other world leaders. After the latest missile launch by North Korea last Friday, Trump told troops the U.S. and its allies will not be intimidated. PRESIDENT DONALD TRUMP: We will defend our people, our nations and our civilization from all who dare to threaten our way of life. This includes the regime of North Korea, which has once again shown its utter contempt for its neighbors and for the entire world community. KELLY: Well, today the U.S. carried out bombing drills with the South Korean military in a show of force over the Korean Peninsula. Let's step back for a minute now and consider a new NPR/Ipsos poll on North Korea. It finds a narrow majority of Americans do not trust the president to handle North Korea and its nuclear threat. NPR's Scott Horsley is here now to talk about that. Hey, Scott. SCOTT HORSLEY, BYLINE: Good morning, Mary Louise. KELLY: Good morning. So let me lay out these numbers. The poll finds 51 percent of those surveyed say they do not trust President Trump when it comes to North Korea, and of those, 40 percent say they feel strongly about that. So what does this tell us? HORSLEY: Those are net figures, Mary Louise. Among Republicans, a large majority do trust the president. Among Democrats, a large majority do not. With independents, it's a narrow majorities who say they do not trust the president. So some of this is just the sort of background partisan-polarization we often see on issues like this. But with North Korea specifically, this may also reflect some concern about Trump's more bellicose tweets - you know, locked and loaded, and fire and fury. Lynn Siegfred (ph) is a registered Republican who lives outside Milwaukee, and she has some concerns about Trump when it comes to dealing with Pyongyang. LYNN SIEGFRED: Just based on how he's reacted to other world situations, it's really hard to say what he'll do. I mean, he's a bit unpredictable. I think that's the only way you can look at it. HORSLEY: And that's deliberate on Trump's part. He sees it as a positive to keep America's adversaries guessing about what he might do. But as our polls suggest, that unpredictability also makes a lot of Americans a little nervous. KELLY: Now, the poll also focused on the question of the president's authority to order a nuclear strike and found a lot of confusion here. HORSLEY: Yeah. Most Americans don't believe the U.S. should ever use nuclear weapons, but we asked, what would it take if the president decided to launch a nuclear strike? And Ipsos' Vice President Chris Jackson says most people got the answer wrong. CHRIS JACKSON: The real answer is he just orders it. There's no other check to him ordering a nuclear attack. But the majority of Americans, a large majority of Americans, three-quarters, think that there is some sort of check - that either he has to get approval from Congress or he has to coordinate with the secretary of defense or he has to get confirmation from the Joint Chiefs. HORSLEY: ...Might need to replay that segment because just 24 percent of the people in our survey knew the president can order a nuclear strike on his own authority. KELLY: Well, that is a stunning thing to consider, any one person is invested with that kind of power. Just very quickly, Scott, one other point the poll addressed, and that was what responsibility the U.S. bears for defending allies - Japan, South Korea. What'd it find? HORSLEY: Yeah. A large majority, 74 percent, say the U.S. has an obligation to protect those allies in East Asia. And here there was very little partisan divide. We saw similar responses from Republicans, Democrats and independents. KELLY: All right. Thank you Scott. KELLY: NPR's Scott Horsley. Transcript provided by NPR, Copyright NPR.